Urban Initiatives is excited to announce our 2016-2017 partnership with Target! Target is the Champion Sponsor of our Play with Potential program, which serves over 11,200 students in 18 schools across Chicago! 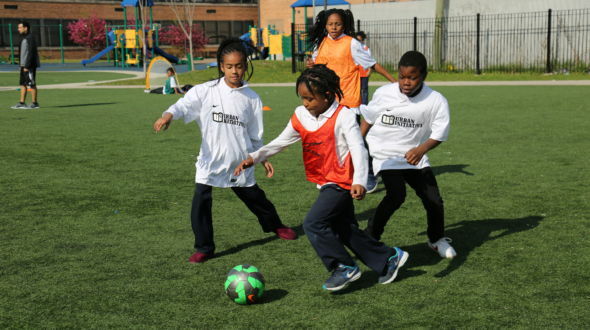 Play with Potential is a structured recess program which aims to maximize the health, academic, and social and emotional learning benefits of recess periods as well as improve the overall health environment of school communities. The program provides support for schools and students during recess in order to improve students’ academic performance and health as well as teach them skills important to life­long success. Target is committed to creating stronger communities. Each year, they give 5 percent of their profit to communities, which adds up to more than $4 million each week, sponsoring wellness and education programs, arts and cultural institutions, and supporting families recovering from a disaster.